We are delighted to add more acts to our New Sounds event on Thursday 30th October. Thumpers: Their debut album ‘Galore’ was released to much adoration from fans and critics earlier this year. Released through Sub Pop in the States and Sony RED in the UK, and published by Transgressive, it has seen the band tour triumphant runs across America and Australia, plus headline a memorable night at a packed Scala in London. N.B. This special low-key show for the band as part of New Sounds will see them whiz up the motorway from Brighton – where they will have just played the same night as special guests to Klaxons. They will perform a late night set after Alvvays have performed. FAMY: Not dissimilarly to Thumpers, FAMY’s magnificent debut ‘We Fam Econo’ LP surfaced recently to incredible support from BBC Radio 1 and blogs alike. With their oceanic, yearning anthems in tow, the spiritual side of the night’s line-up is in epic hands with the ever-magnificent and magical FAMY. One more brand-new live act will be announced on the day of the show to open the night, capping the six-band bill. 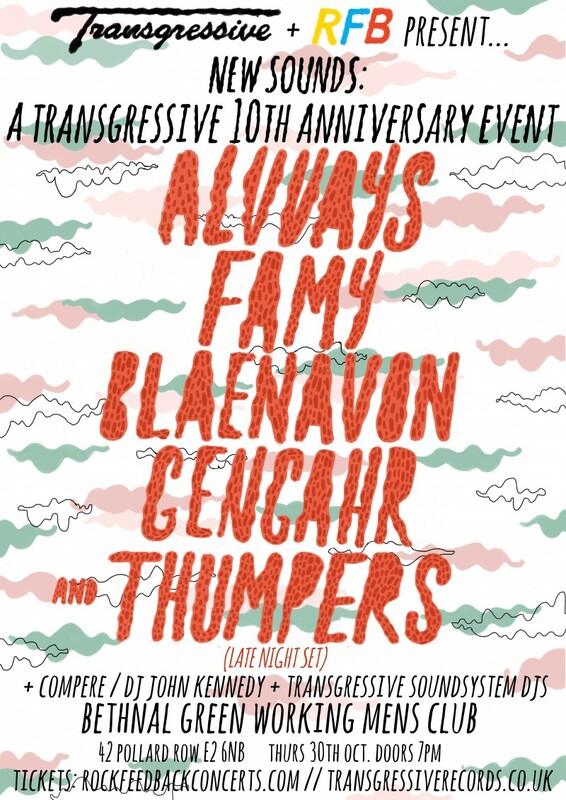 Already announced for the event are Alvvays, Blaenavon and Gengahr, which occurs at London’s Bethnal Green Working Men’s Club on Thursday October 30th. Transgressive Soundsystem will appear on the decks alongside Xfm’s new music hero John Kennedy, who will also compere the night.